A giant has fallen and is breathing its last breath. Will it be able to get up again? 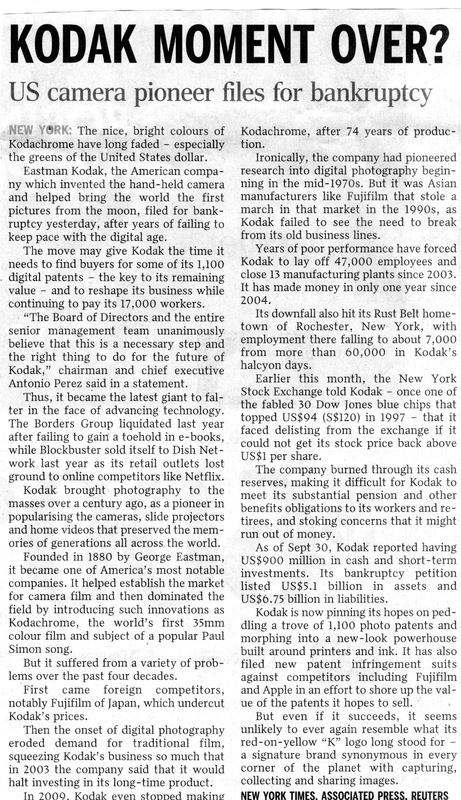 I attached much sentimental past with Kodak cameras and Kodachrome movie film. During school days I had a Kodak Brownie camera. It was cheap and easy to use. Later I upgraded to a Brownie box camera. Each negative was square in shape and the hard copy was exactly the same size as the negative. I do not know the reason for keeping the negatives except putting them aside after the photos were printed. Now they have become more precious as the negatives and the photos reminded me of the past, especially my growing up years. 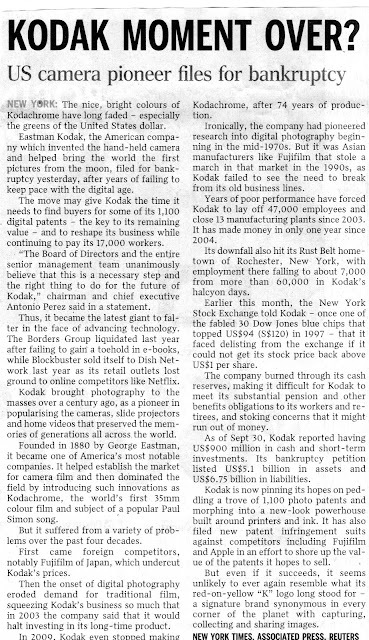 In the 1950s and 1960s there was only Kodak and Ilford films in the market. Japanes brand like Fuji and others were not introduced in Singapore yet. Besides Kodak cameras I also owned a Minolta movie camera. There was no Japanese 8 mm film for movie camera on sale except Kodak 8 mm movie film which could be processed only in Australia. I forgot the cost for each reel of movie film but the cost of processing was S$10. It took at least about a week for it to be sent to Australia for proessing and back. I took movies mostly of my kids. 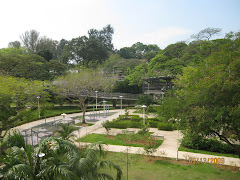 We visited many places of interest in Singapore such Haw Par Villa, the old National Theatre and Van Kleef Aquarium, Raffles Place, Changi beach and others. I have posted a few film clips on the Facebook. Each small reel of movie film was glued together to make it into a spool for about half an hour show. I had a Japanese projector but the film was often jammed and burnt due to very intense heat from the projector's light. I had to cut the film, removed the burnt part and joined the two ends together. Much films were wasted in this way. It was very tedious as everything was done manually. Thinking about it, the time spent was really worth. Now I can look back when I was once young. I can still see in the movie films (converted to DVD) the places that had disappeared or had new landscapes. National Theatre and Van Kleef Aquarium had been demolished. Raffles Place has new landscaping. The Changi beach that we used to go for swimming and picnics is different now. The kelongs or fishing stakes that were close to the beach and the sampans for hire had disappeared too. When my kids were growing up, I did the same. In my case it was VHS. Less troublesome than your 8 mm films of course, but still very tedious compare to todays SD cards etc. Now even a cheap digital camera comes with HD video recording. This is real progress. In 1985 my VHS camcorder did not have a battery pack attached. The battery, about the size of an excercise book and slightly thicker had to be carried with a sling over the shoulder. When carried over a period of time, it could be quite tiring. I was recording my son's passing out parade at SAFTI. It is a pity I don't have a photo to show the VHS camcorder and the battery pack.